The proposal from the European Commission to set out CO2 emission performance standards for new heavy-duty vehicles has been amended by Members of the European Parliament (MEP). On the 14th of November MEP backed the tightening of CO2 reducing targets from the original proposal, increasing the target from 15% to 20% for the period 2025-2029 and from an aspirational target of 30% to at least 35% in 2030. On the 13th November the Parliament also voted to increase the EU’s binding renewable fuel share to 32%, up from an earlier proposed 27%, or double the 2016 share of 16%. Both targets have been increased 5% from the original proposal of 15% and 30% for 2025-2209 and 2030, respectively. In addition, the new legislation requires that zero and low emission vehicles account for 5% market share of manufactures new vehicle sales in 2025 and 20% in 2030. The first proposal stated that readily available technologies could improve truck fuel efficiency by 15-20% and a previously amended proposal on 25/10/2018 stated a more precise figure of 18%. However, market penetration of these technologies is low due to the cost increase of the vehicle for customers, due to technologies being an optional extra. In order to meet the targets set these technologies will have to become the default as well as the introduction of new technologies which is going to be very challenging for OEMs in this time frame. As the technologies are added the cost of a truck will rise with the increased upfront cost causing an issue for truck operators, who tend to be small and medium sized business with tighter budget constraints, even if lifetime costs of the truck outweigh this additional cost. Therefore, an increase in subsidies to significantly increase the market pentation of zero and low emission vehicles will be needed. VECTO limitations will restrict technology options…..
Another issue is the capability of VECTO which currently only covers a specific list of CO2 reducing technologies. OEMs are unlikely to bring new technologies into the market unless they are compatible with VECTO. OEMs will be able to pool volumes to meet targets…. Connected manufactures are able to pool together to meet the proposed standards, which is beneficial for the big players such as TRATON and Daimler. The definition for low emission vehicles has been changed from a specific figure of 350 g CO2/km to a 50% reduction of CO2 emissions to the reference emission for each sub-group. A long-haul truck, according to Transport Environment, emits around 900 g CO2/km, hence the change in the definition makes it easier for manufactures to shift a long-haul truck into a low emission vehicle but also makes distribution trucks which will be used in cities more difficult as CO2 emissions are lower for a lighter truck. The specific manufacturer zero and low emission factor has been replaced by a benchmark applicable to all manufacturers. The benchmark values for 2025 and 2030 are 5% and 20%, respectively. Definitions, including technical criteria, for vocational vehicles and urban buses to be specified by 1 July 2019. These vehicles will be included in the manufacturer share of zero and low emission vehicles even though they are not applicable to the CO2 target. A new addition to the proposal is in the form of third-party testing. A new on-road in-service conformity testing is to be introduced which requires fuel consumption to not exceed the monitory data reported by 10% suing standardised fuel consumption meters. Annual testing of manufactures sample of components, technical units and full systems will also be introduced. The original excess emission premium set for exceeding CO2 emissions caused concern for OEMs due to the penalty being much higher in comparison to light vehicle legislation, even though heavy-duty vehicles have a significantly better efficiency on a tonne to km basis. The penalty has been slightly reduced for the period 2025-2029 (a) but remains the same as the original proposal for 2030 onwards (b). The amended regulation will demand an increase in the adoption of zero and low emission vehicles but how can OEMs sell a vehicle that cannot be easily refuelled? It is likely that OEMs will concentrate on electric medium-duty vehicles to help meet the stringent targets set. However, infrastructure for charging remains a problem and until it is resolved market penetration of electric trucks cannot significantly increase. Currently Tesla and ChargePoint are known to be developing chargers for electric trucks, however, wide scale implementation of charging infrastructure will take time and huge investment. Not only is infrastructure for electric vehicles lacking so is refuelling for alternative fuels. While a significant number of stations for CNG in Europe are being opened, investment in LNG stations, which is used for long-haul trucking, is limited. Another issue concerning the reduction of CO2 is fuel sourcing. The legislation is a well to wheel (WTW) approach which does not incentivise total CO2 reduction from the use of renewable sources. However, the amended proposal does stress the need to increase investment for sustainable energy sources and for the EC to evaluate the option of include full life-cycle CO2 emissions. The EC will publish a by 31st December 2022 evaluating the effectiveness of this regulation including evolution of VECTO. The review in 2022 will assess the 2030 reduction target taking into account uncertainties of market uptake of new advanced technologies, however, the ambition of the target is not to be lowered. Targets were proposed for zero-emission urban buses; which required a manufacturer’s fleet of urban buses to include 50% zero-emissions urban buses in 2025 and 75% in 2030. Zero emission vehicles account for two vehicles in the first proposal, however, this has been altered depending on mileage travelled a year. A zero-emission vehicle which travels <100km still accounts for two vehicles but vehicles travelling >100km accounts for 3 vehicles, >200km 4 vehicles and >400km 5 vehicles, respectively. The EC proposal capped credits for zero emission trucks, this has been amended allowing trucks with range >400km being exempt. Although these changes have been made the likelihood that the regulatory incentive weight out the cost of a heavy-duty zero-emission vehicle is minimal. Therefore, alternative incentives will need to be put in place for the shift to cleaner vehicles for long-haul trucking. 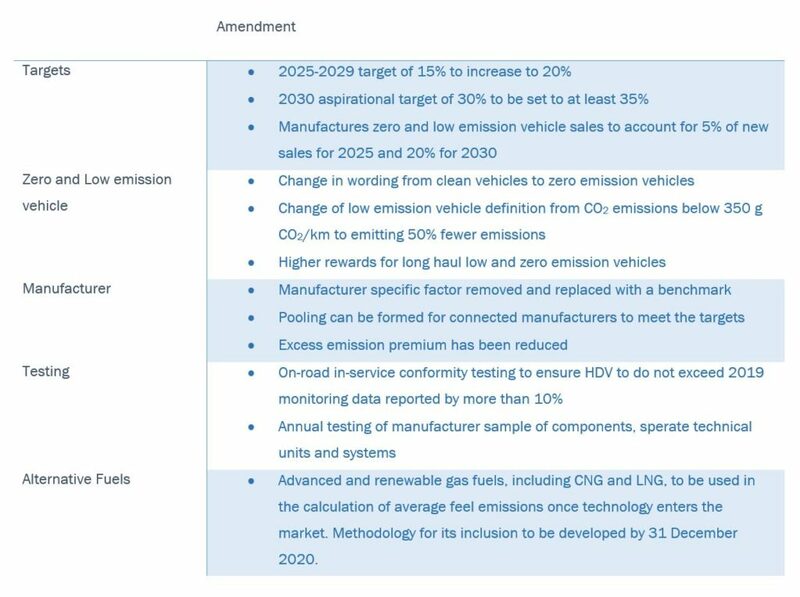 The penalty was changed to Excess emission premium = Excess emissions x 570 (editor note: this looks like a type in the proposal and should have been 5700) €/gCO2/tkm. The definition of low emission vehicle changed to emitting 35% fewer emissions that the 2019 baseline.